Dallas Cowboys quarterback Dak Prescott and the rest of his offense earned a 30-10 win over the New York Giants after hitting a mid-season slump with Ezekiel Elliott‘s suspension. Prescott completed 20-of-30 passes for 332 yards and three touchdowns. Running back Rod Smith and wide receiver Dez Bryant were the Dallas signal-caller’s go-to targets, combining for 186 yards and two touchdowns. Returning to start under center after his one-game benching, Giants quarterback Eli Manning couldn’t match Prescott & Co. stride for stride, as he completed 31-of-46 passes for 228 yards, one touchdown and two interceptions. Prescott completed 20-of-30 passes for 332 yards with 3 touchdowns and four dropped passes. Prescott averaged an impressive 11.07 yards per attempt. Prescott completed just one of his two deep-pass attempts (20 yards or more in the air) with his completion coming via an impressive pass up the seam to Jason Witten to essentially put the game away. Prescott was not asked to do the extraordinary, as the Cowboys played to their defense and running game to set up the pass, but he was consistent and mistake free. He was also clutch under pressure, as he completed 5-of-8 passes (including 2 drops) for 91 yards and a touchdown on pressured dropbacks. Rod Smith had six rushing attempts and five receptions, and he averaged 3.67 yards after contact and forced two missed tackles rushing. Smith had two runs of 15 yards or more on his six rushing attempts, helping him total 47 yards. Smith also took a slant route to the house for a touchdown late in the game to finish with 113 yards receiving on five targets thrown his way. Both Smith and his backfield counterpart Alfred Morris were fun to watch, as the duo made several nice cuts in the Cowboys outside zone running scheme. 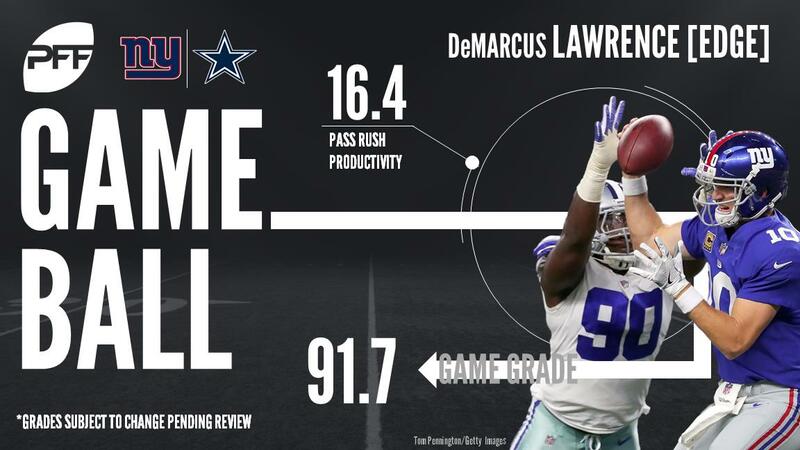 DeMarcus Lawrence lined up against Bobbie Hart for most of the game, and while he didn’t record a sack, he was too quick for Hart all game long. Lawrence registered one hit and six hurries to go with two stops in the run game. He beat on several other passing plays, but Eli Manning got the ball out just before he had a chance to record a pressure. Sean Lee was all over the field for the Cowboys, recording 13 tackles and seven assists with six stops. His main contribution was in pass coverage, where he allowed seven catches and recorded an interception. To his credit, only one of the catches he allowed went for more than six yards, as he closed quickly to make a tackle. With much to do about the Giants past two games, this one looked to be put on the shoulders of longtime quarterback Eli Manning. While he had the Giants in the game for most of the contest, Manning received little help from his receivers as they were struggled to get any easy yards. On only one pass attempt did Manning find an open receiver more than 10 yards downfield, and that was on a busted coverage. Everything else Manning threw in this game was short and mostly in the between the numbers. Engram was not his best in the passing game, but he was still one of the better Giants pass-catchers on the field. He caught four of his seven targets for 54 yards. However, in the run game, Engram has a lot of work to do. Too often Engram found himself beat and beat quickly as a run blocker. The opposing edge defender or linebacker he was blocking would find the way to the ball carrier, giving the running back very little chance to make anything happen. Cockrell was fantastic in the Giants secondary, as he had two tackles and an assist in run defense (including one defensive stop). Pass defense was where Cockrell shined, however, allowing two receptions on four targets thrown his way including a couple of nice pass breakups. Damon Harrison produced two stops in run defense to finish with three tackles and an assist in an effort to help control the Cowboys’ rushing attack. Dallas’ patience with their running game paid off later in the game, as they began to split the Giants’ defense and produce the running lanes their outside zone scheme is well known for.